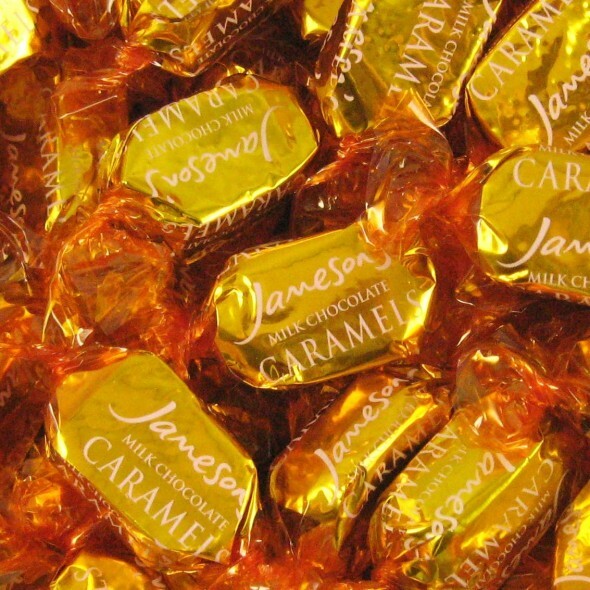 Jamesons: Caramels Premium Quality Caramels covered in Milk Chocolate, individually wrapped. Ingredients: Milk chocolate 27%, (sugar, cocoa butter, whole milk powder, cocoa mass, milk fat, emulsifier; Soya Lecithins). Flavouring). Glucose Syrup, sugar, sweetened condensed skimmed milk, (skimmed milk, sugar) Palm oil, Butter oil, invert sugar syrup,, emulsifier (soya lecithins). Flavouring. Salt. Milk chocolate contains milk solids 14% minimum. Contains milk and soya, suitable for vegetarians.